When we were growing up, our salads only knew two types of dressing: French and the make-it-yourself Good Seasons Italian. 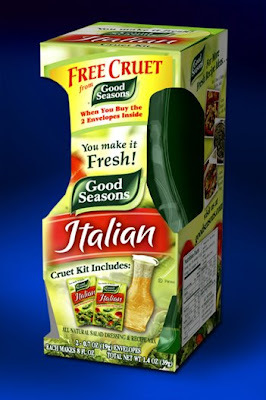 In purchasing the Good Seasons Italian Dressing packets, my father had the grocery store under his thumb for he knew the secret of the cruet! On each of his four children’s thirteenth birthday, he would impart the secret of the Good Seasons Italian Dressing Cruet Kit to us. Now, I will share that secret with you. 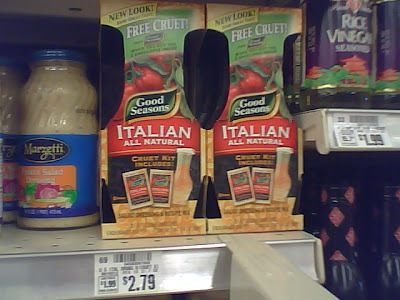 To get consumers hooked on their Italian Dressing packets, those crazy marketing folks over at Good Seasons packaged two packs of the dry dressing mix with a FREE cruet. I think “cruet” was second foreign word I learned right after “Irish Spring.” The cruet that came with the dressing had three convenient lines etched on it for easy construction of the Italian Dressing. First V for vinegar, then W for water and last O for oil. Fill each ingredient to its line (pour in the packet between the W and the O,) cap the lid and shake shake shake. In 1983, my brother was making the dressing and put the oil in first. The resulting explosion took off the east wing of our kitchen and Steve never heard the same out of his remaining ear. The marketing folks assumed that you would by the cruet kit the first time and then buy the individual packets from then out. But they never calculated the my dad would figure out their little secret. So back to my thirteenth birthday… after the cake and the gifts, dad took me into the kitchen and showed me the cruet kit and said, “When you buy the Italian dressing in the kit, they give you two packets of dressing and the cruet. If you buy the packets individually, THEY COST MORE PER PACK! When you buy the kit, you are getting the packets cheaper AND a free cruet.” It was then that I noticed the third shelf up in our dishware cabinet was filled with cruets. The everything drawer teemed with the plastic lids. Week by week and cruet by cruet, my father was slowly putting the Good Seasons people out of business. A savings of $.195 per packet. I figure in my father’s lifetime, he has saved about $25,345. That’s almost enough to cover the by-pass surgery! He’s also got a basement full of cruets and no other glassware to be found in the house. As for me? I have saved $1.17 because as soon as Miss Sally noticed what I was doing, she shut down the cruet purchases and made me spend the extra twenty cents to buy the packets individually sans cruet. Miss Sally runs a tight ship. I can’t wait for my kids to turn thirteen. A lot of people find this site because they are searching for replacement lids or cruet kits. If I was smart, I would sell them from this site and make a billion dollars. But I am not smart. If you want to buy the kits on line, look here at Net Grocer. Good luck. Please tell them I said, "Howdy!" Awesome story. It made my day. I now know what a cruet is. Thanks, Holyjuan! 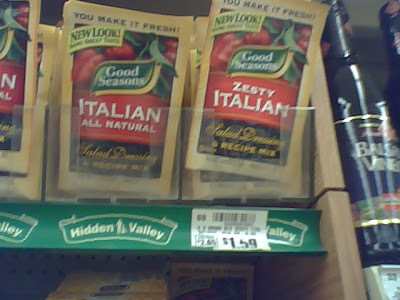 Where is it that they hide the "Hidden Valley"?? Yeah Susan, you shake that up without the lid on and you've got about a six hour clean up job. Try using a puff pastry baked on the top of the cruet to keep that oily mess in. Yes, but the 4 packs are still cheaper per pack than the cruet sets. Liz? Are you daft? The four pack doesn't come with a free cruet! When you add in that cost, the cruet pack is WAY more valuable! Who needs the packets!, 1/3 cup balsamic vinegar, 2/3 cup extra virgin olive oil, 2-3 cloves garlic through your garlic press, teaspoon dijon mustard, 1 tsp honey, a palmfull of your favorite herbs, salt and pepper. (Why water?) Shake Shake Shake. After a few years (of going through the dishwasher) the lid starts to leak - pick up another cruet. You buy store bought balsamic vinegar and store bought olive oil? How dare you? Make your own or else it's not good enough. Some people have such nerve. To bad no stores in my area carry the cruet on there shelf's. I stumbled upon this blog because I googled "Good Seasons Cruet Lid," as I am desperately searching for somewhere to buy new snap lids for my two existing cruets, they got lost over the years... would your father be willing to part with some lids? I can keep trolling the internet if he's not, ha ha. Hi Abbie! That is very interesting that you ask... I get about three hits a day of people asking about replacement lids. They stopped selling them in my local store, so they seem like they are becoming rare. I had dad put me in his will as the child that will get the lids, so when he crosses the road, I'll let you know! You're way too funny. I haven't had Good Season's since I was a kid, and now I'm so curious if it's actually good or not... must try again! We buy the ten pack box. When we still had Tops grocery in the area they had a "store brand" version of Good Seasons that was way cheaper and tasted exactly the same. I thought I was so clever. Then Tops left Ohio. I'm the only one in the family who likes Good Seasons so the ten pack box lasts a long time. I thought the secret was going to be the amounts of vinegar, oil and water so one wouldn't need the cruet. Buy the cruet kit, return the 2 packets for a total gain of $0.39. Repeat daily, build fortress in the mountains entirely of cruets. Begin career as super-villain. Greatest idea ever! In 40 years, I'll be a thousandaire. i love to bake and cook. after reading this blog, i was trying to figure out how you could use your cruet, and save money. Mix all ingredients together and store in an airtight container. To prepare the dressing: Mix two tablespoons of the mix with ¼ cup vinegar, 2 tablespoons of water, and ½ to 2/3 cup olive oil or canola oil. I went to the Kraft Foods site (http://www.kraftrecipes.com/home.aspx) and used the "contact us" link to ask where I could purchase a replacement lid for my Good Seasons dressing cruet. A couple days later I received an E-mail saying they would send me a new lid. Several days later I had a replacement lid. No charge. I suspect calling Kraft would work too. 1-800 number is on the package. As with some of your other commenters, I wish you or your father would part with one of those green snap lids or even a cruet with lid. Not only are they the best of the cruet designs, but my cruet (now lidless) was handed down to me from my mother and is a wonderful reminder of my years in the kitchen with her. As it now stands, I can't use the cruet anymore as a salad dressing mixer, and I miss its efficient design. Please let all of us looking for that replacement green lid know if you ever do decide to part with any. I only need one, but I'll pay for two complete sets - shipping and everything! I just bought 2 cruets with lids at Goodwill yesterday. There was one more there. Guess I will return for it. Glad I found this- my lid got melted, so I broke down and bought a kit at our local Tops. But wouldn't you know, when I opened it, some lidless a$$ had stolen the lid (although the package was sealed, you could see where they'd pried the lid out.) I wrote to Kraft at the site given by Anonymous, and told them my sad story. We'll see what happens! Hi. Anyone able to tell me what the measurements on these good seasons cruets are? I decided to make my own dressing for WW and used Apple Cider Vinegar to the first line, Lemon Juice to the second and Olive Oil to the third. I then promptly realized I have no idea what I poured into the cruet!! Tasted good and used 4 teaspoons, but wondering if you can tell me the measures. Super awesome! I'm gonna do this. Thank you. I sent an email to Kraft Foods per the instructions on this Blog and got two new lids gratis and a nice letter to boot. Thanks! I just tried to get get help on Kraft site and no phone numbers are listed for customer service. I found the phone number here. I called them and they are out of the lids and told me to call back in a month. The whole time I was on hold for them the phone message said how I was an important caller and my husband had to make a joke about that since if I really was important I wouldn't have to hold so long. When I did get thru the gal was ok and said to call back in a month since they are out of them. No way to just put in an order for them. Plus she wasn't sure when they would get more so I am not wasting my time with Kraft anymore. I actually wasn't going to buy any more of their packets since the ingredients list is not that appealing. I am using Braggs Organic Vinegret and cut in half with organic olive oil. I have got gluten free and so no need of so many Kraft products and now won't have any need to use Kraft anything anymore. Maybe this company is doing poorly because many consumers are being more careful of what they buy and this explains why their website is not really working with Firefox at all. The only way I could get help from their site was thru email and they wanted my phone number etc and smacks of collecting data to sell. God knows when I would get a reply. Really fed up with these big food companies on so many levels. They have earned the lack of sales they have now.